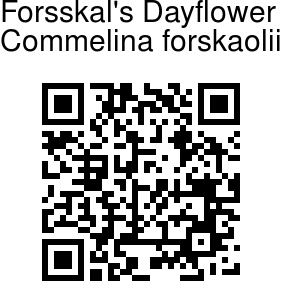 Forsskal's Dayflower is a prostrate herb, 20-30 cm long. Long slender stems are branched and rooted at nodes, which make the plant prostrate. Narrowly oblong leaves are 3-5 cm in length, and have a wavy margin. 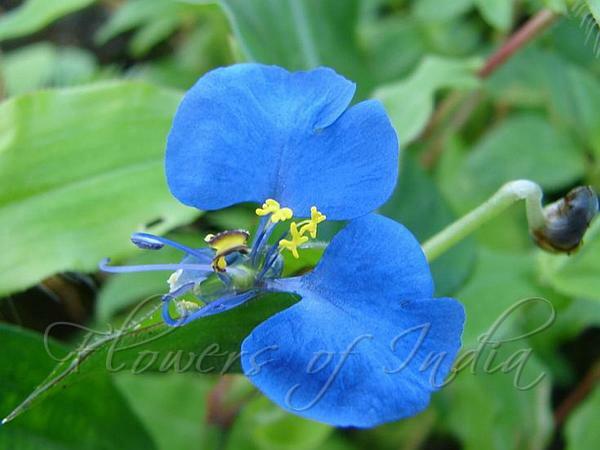 Tiny butterfly like blue flowers are 1 cm across, and occur in cymes of 1-3 at the end of branches. Flowers are enclosed in ovate, hairy, hooded spathes 1-1.5 cm long. The flowers have 3 petals - the larger two are like butterfly wings. There are 3 distinct stamens. Identification credit: Pravin Kawale Photographed in Lonavala, Maharashtra & Delhi.